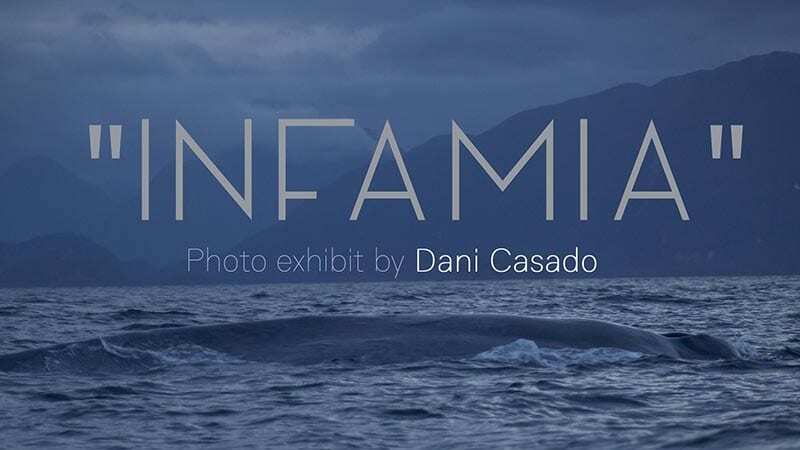 Environmental photographer Daniel Casado’s exhibit, “Infamia“, displays haunting images of life and death in Chiloe, an island off the coast of Chile—from majestic blue whales to the devastating impacts on one of the world’s most vital ecosystems after thousands of tons of rotten salmon were discharged a few miles off shore. Casado’s photos will be exhibited at the Woods Hole Oceanographic Institution’s Ocean Science Exhibit Center (OSEC) until Sunday, August 5. The OSEC is be open seven days a week beginning in August from 10-4;30p.m. Casado combines his love of nature and photography to reflect on humans’ impact on the environment. He has collaborated with conservation NGOs and environmental institutions such as the Chewonki Foundation, Maine Woods Forever, and Maine Farmland Trust.Foundation, Maine Woods Forever and Maine Farmland Trust. Casado is also participating in this year’s Woods Hole Film Festival. His 34-minute short film, “Patagonia Azul: The Interconnection of Life” is included in Shorts 4: World Around U, on Monday, July 31 at 5 p.m. in Redfield Auditorium. Please see the Woods Hole Film Festival for ticket prices or more information. Daniel Casado is a WHOI Mary Sears fellow specializing in environmental and science photography, film, and documentation.